There are estimates that these stable continental region earthquakes were felt strongly over roughly 130,000 square kilometers (50,000 sq mi), and moderately across nearly 3 million square kilometers (1 million square miles). The 1906 San Francisco earthquake, by comparison, was felt moderately over roughly 16,000 km2 (6,200 sq mi). The New Madrid earthquakes were interpreted variously by American Indian tribes, but one consensus was universally accepted: the powerful earthquake had to have meant something. For many tribes in Tecumseh's pan-Indian alliance, it meant that Tecumseh and his brother the Prophet must be supported. December 16, 1811, 0815 UTC (2:15 a.m.); (M 7.5–7.9) epicenter in northeast Arkansas. It caused only slight damage to man-made structures, mainly because of the sparse population in the epicentral area. The future location of Memphis, Tennessee, experienced level IX shaking on the Mercalli intensity scale. A seismic seiche propagated upriver, and Little Prairie (a village that was on the site of the former Fort San Fernando, near the site of present-day Caruthersville, Missouri) was heavily damaged by soil liquefaction. December 16, 1811 (aftershock), 1415 UTC (8:15 a.m.); (M 7.4) epicenter in northeast Arkansas. This shock followed the first earthquake by six hours and was similar in intensity. January 23, 1812, 1500 UTC (9:00 a.m.); (M 7.3–7.6) epicenter in the Missouri Bootheel. The meizoseismal area was characterized by general ground warping, ejections, fissuring, severe landslides, and caving of stream banks. Johnson and Schweig attributed this earthquake to a rupture on the New Madrid North Fault. This may have placed strain on the Reelfoot Fault. February 7, 1812, 0945 UTC (3:45 a.m.); (M 7.5–8.0) epicenter near New Madrid, Missouri. New Madrid was destroyed. In St. Louis, Missouri, many houses were severely damaged, and their chimneys were toppled. This shock was definitively attributed to the Reelfoot Fault by Johnston and Schweig. Uplift along a segment of this reverse fault created temporary waterfalls on the Mississippi at Kentucky Bend, created waves that propagated upstream, and caused the formation of Reelfoot Lake by obstructing streams in what is now Lake County, Tennessee. Susan Hough, a seismologist of the United States Geological Survey (USGS), has estimated the earthquakes' magnitudes as around magnitude 7. There were many more aftershocks, including one magnitude 7 aftershock to the December 16, 1811 earthquake which occurred at 0600 UTC (12:00 a.m.) on December 17, 1811, and one magnitude 7 aftershock to the February 7, 1812 earthquake which occurred on the same day at 0440 UTC (10:40 p.m.). John Bradbury, a Fellow of the Linnean Society, was on the Mississippi on the night of December 15, 1811, and describes the tremors in great detail in his Travels in the Interior of America in the Years 1809, 1810 and 1811, published in 1817. After supper, we went to sleep as usual: about ten o'clock, and in the night I was awakened by the most tremendous noise, accompanied by an agitation of the boat so violent, that it appeared in danger of upsetting ... I could distinctly see the river as if agitated by a storm; and although the noise was inconceivably loud and terrific, I could distinctly hear the crash of falling trees, and the screaming of the wild fowl on the river, but found that the boat was still safe at her moorings. By the time we could get to our fire, which was on a large flag in the stern of the boat, the shock had ceased; but immediately the perpendicular banks, both above and below us, began to fall into the river in such vast masses, as nearly to sink our boat by the swell they occasioned ... At day-light we had counted twenty-seven shocks. Eliza Bryan in New Madrid, Territory of Missouri, wrote the following eyewitness account in March 1812. On the 16th of December, 1811, about two o'clock, a.m., we were visited by a violent shock of an earthquake, accompanied by a very awful noise resembling loud but distant thunder, but more hoarse and vibrating, which was followed in a few minutes by the complete saturation of the atmosphere, with sulphurious vapor, causing total darkness. The screams of the affrighted inhabitants running to and fro, not knowing where to go, or what to do—the cries of the fowls and beasts of every species—the cracking of trees falling, and the roaring of the Mississippi— the current of which was retrograde for a few minutes, owing as is supposed, to an irruption in its bed— formed a scene truly horrible. On the night of 16th November [sic], 1811, an earthquake occurred, that produced great consternation amongst the people. The centre of the violence was in New Madrid, Missouri, but the whole valley of the Mississippi was violently agitated. Our family all were sleeping in a log cabin, and my father leaped out of bed crying aloud "the Indians are on the house" ... We laughed at the mistake of my father, but soon found out it was worse than the Indians. Not one in the family knew at the time that it was an earthquake. The next morning another shock made us acquainted with it, so we decided it was an earthquake. The cattle came running home bellowing with fear, and all animals were terribly alarmed on the occasion. Our house cracked and quivered, so we were fearful it would fall to the ground. In the American Bottom many chimneys were thrown down, and the church bell in Cahokia sounded by the agitation of the building. It is said the shock of an earthquake was felt in Kaskaskia in 1804, but I did not perceive it. The shocks continued for years in Illinois, and some have experienced it this year, 1855. The Shaker diarist Samuel Swan McClelland described the effects of the earthquake on the Shaker settlement at West Union (Busro), Indiana, where the earthquakes contributed to the temporary abandonment of the westernmost Shaker community. The underlying cause of the earthquakes is not well understood, but modern faulting seems to be related to an ancient geologic feature buried under the Mississippi River alluvial plain, known as the Reelfoot Rift. The New Madrid Seismic Zone (NMSZ) is made up of reactivated faults that formed when what is now North America began to split or rift apart during the breakup of the supercontinent Rodinia in the Neoproterozoic Era (about 750 million years ago). Faults were created along the rift and igneous rocks formed from magma that was being pushed towards the surface. The resulting rift system failed but has remained as an aulacogen (a scar or zone of weakness) deep underground. 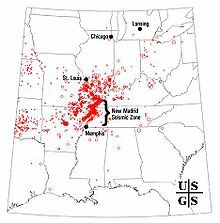 Damage-range comparison between a moderate New Madrid zone earthquake (1895, magnitude 6.8), and a similar Los Angeles event (1994, magnitude 6.7). ^ "U.S. Geological Survey: Largest Earthquakes in the United States". Archived from the original on December 13, 2016. Retrieved August 28, 2017. ^ Richard A. Lovett, Quake analysis rewrites history books, Nature News, April 29, 2010. ^ Bradbury, John (1817). Bradbury's Travels in the interior of America, 1809–1811. Applewood Books. pp. 199–207. ISBN 978-1-4290-0055-0. ^ Letter of Eliza Bryan found in Lorenzo Dow's Journal, Published By Joshua Martin, Printed By John B. Wolff, 1849, p. 344. Accessed 2009-09-17. Archived 2009-09-21. ^ Reynolds, John (1855). My own times: embracing also the history of my life. B. H. Perryman and H. L. Davison. p. 125. Retrieved July 10, 2011. ^ Diary of Samuel Swan McClelland, in "Shakers of Eagle and Straight Creeks," Shakers of Ohio: Fugitive Papers Concerning the Shakers of Ohio, with unpublished manuscripts, J. P. MacLean, ed. Columbus, Ohio, 1907. ^ "USGS Release: Scientists Update New Madrid Earthquake Forecasts". Usgs.gov. 2003-01-13. Retrieved 2008-11-08. ^ Carey Gillam (November 20, 2008). "Government warns of 'catastrophic' U.S. quake". Reuters. Retrieved 2012-02-25. The Introduction to The Lost History of the New Madrid Earthquakes by Conevery Bolton Valencius.